R5-F7 is an astromech droid minifigure released in 2012. He appears in two sets, 9495 Gold Leader's Y-wing Starfighter and 75023 Star Wars Advent Calendar. R5-F7 is mainly white, having legs of that colour and his base body and head as well. He has the same shape head as R5-D8 and R5-J2. 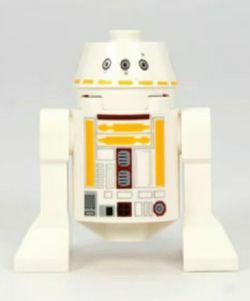 His body markings are similar to R5-D8's, but with yellow printing instead of red. R5-F7 served as Lieutenant Lepira's (Gold Four)'s R5-series astromech droid on his Y-wing starfighter during the Battle of Yavin, where he was destroyed along with the ship and Lepira. Some scavengers then found his body missing a right leg. they repaired him, sold him to Jawas, and finally resold to Boba Fett and was eventually blown up along with the Slave I. Although this droid is released in the set "Gold Leader's Y-wing Starfighter", R5-F7 is actually Gold Four's astromech droid. This droid is one of the three first droids to have an R5-series head. This droid is the first (and to date only) Astromech Droid Minifigure to feature yellow printing. In the January 2012 LEGO Catalogue, R5-F7 is incorrectly labelled as R2-A3 in the description of "Gold Leader's Y-wing Starfighter" (R2-A3 being a red astromech droid owned by Wedge Antilles).